We continue Rob Couteau’s interview with Robert Roper, author of the new book Now the Drum of War: Walt Whitman and His Brothers in the Civil War. Today, the two writers will look at the way Whitman captured—or didn’t—the voice of the common soldier in his work and how that might relate to Whitman’s attitudes about war. ROBERT ROPER: Yeah. He’s very much under the influence of Emerson: the poet is a representative being, and he subsumes all of us, and can speak for us, because he has a gift we don’t have. And Walt’s may have coincided with his own high, justified estimation of his abilities. But he really took that and ran with it. He sort of thought: Well, that’s the responsibility of the poet. He’d speak for these people who, in some sense, are dumb. Emerson says the impressions fall too weakly upon most of us. We feel things, but we’re not quite stirred to memorable utterance, whereas the poet can do it for us. You know, it sounds like I’m condemning him, and I don’t intend to do that. I just noticed that being a salient aspect of his war poetry. But I think it’s overwhelming; what are you supposed to do if you’re talking to thousands of young boys? Are you supposed to give all of them a voice? Are you supposed to quote ten of them, or a hundred, or fifteen hundred? He’s also a poet who wants to produce books. So, he tries to say the truth, trusting that, when it comes through him, it’s going to work. RC: In the 1860 “Song of Joy,” he writes: “To see men fall and die and not complain!” He also writes: “I will show that nothing can happen more beautiful than death.” Throughout his work, death is often portrayed as an entirely positive thing. Is this the result of his mystical view of death? That it’s of no consequence; therefore, one should meet it calmly, and we don’t have to focus on its negative aspect? RR: That’s very plausible. He had this great truth he wanted to communicate – among many other truths – that death comes like a lover. It’s greater and more beautiful than anyone has said yet. That might have been part of why he doesn’t let the soldiers scream and be horrified, the way I imagine I would be in that sickbed, and a lot of people would be. Perhaps because to be true to that would drown out this other thing that has its own truth, which he really wanted to communicate. That’s partly it. Again, there’s the need to produce a book: to subsume all of this. It’s tangentially related, but as I talk about in my book, he set out to write a regimental history of George and the 51st: this very hard-fighting famous regiment. And many regimental histories have been written. But finally, I think it was a little, I don’t know, beneath him, or he felt he had more important books to write. But it’s also, if you start talking about cases, if you try to get historically accurate and detailed about everything, you’re going to lose yourself in that. And that just wasn’t his vocation. RR: Yeah, that’s pretty frank, isn’t it? But of course, he’d probably distinguish war from death. Death is a deliverer. He saw these guys with unspeakable wounds, dying for ten, fifteen, twenty days, then death finally takes them. It’s like a great blessing. In tomorrow’s installment, the writers will talk about Whitman’s groundbreaking Leaves of Grass, the tone of Whitman’s poetry, and the impact Whitman’s service in the army hospitals had on his work. 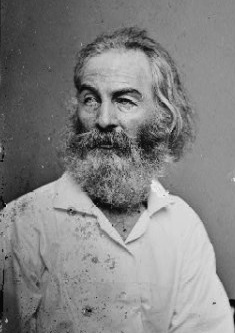 This entry was posted in Books & Authors, Civilian, Common Soldier, Personalities and tagged Drums-of-War-series, Robert Roper, Walt Whitman. Bookmark the permalink. Astute and insightful comments; yes, Walt took it upon himself to speak for those he thought had no voice. Yet, in Specimen Days, he seems to tell (some) soldiers own stories as he describes his relationship with the wounded and dying.